You may love travelling, or you might not be too fussed. Maybe your job means you have to travel, maybe your lifestyle leads to you travelling, or maybe you have family all over the world. Whatever your reason for travel, you still need to take care of your teeth. So what options do you have, in particular with a toothbrush, when is comes to travelling? 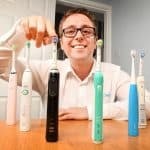 I am going to present what I believe to be some of the best options when it comes to toothbrushes for taking travelling with you, both electric and manual; but I will also go onto explain what options you have when travelling with either as you might well find you can make do with what you already have. Simply put there is no one best toothbrush, because what every user needs and wants from a brush will differ. If you are travelling just for a weekend and have nothing more than hand luggage, the requirement may well be different to those who are spending 6 months working in another country. The following, whether electric or manual, are merely suggestions of ones you could consider. For convenience we have included links to Amazon, but you may like to check other retailers too. Why these brushes? We explain each recommendation in more detail below. A superb blend of simplicity, functionality and practicality at a fantastic price, the PocketPro is a travellers dream electric toothbrush. Using a standard USB to microUSB cable (provided) the brush charges in 10 hours and offers 2 weeks of usage time when fully charged. A 100-240v 2pin power adapter is provided too, but you don’t have to use this. The brush and case are as slim and lightweight as they can be, at just 143g in total. A good clean is offered by the brush and it has a 2 minute timer and quadpacer built in as well as an automatic power off feature. 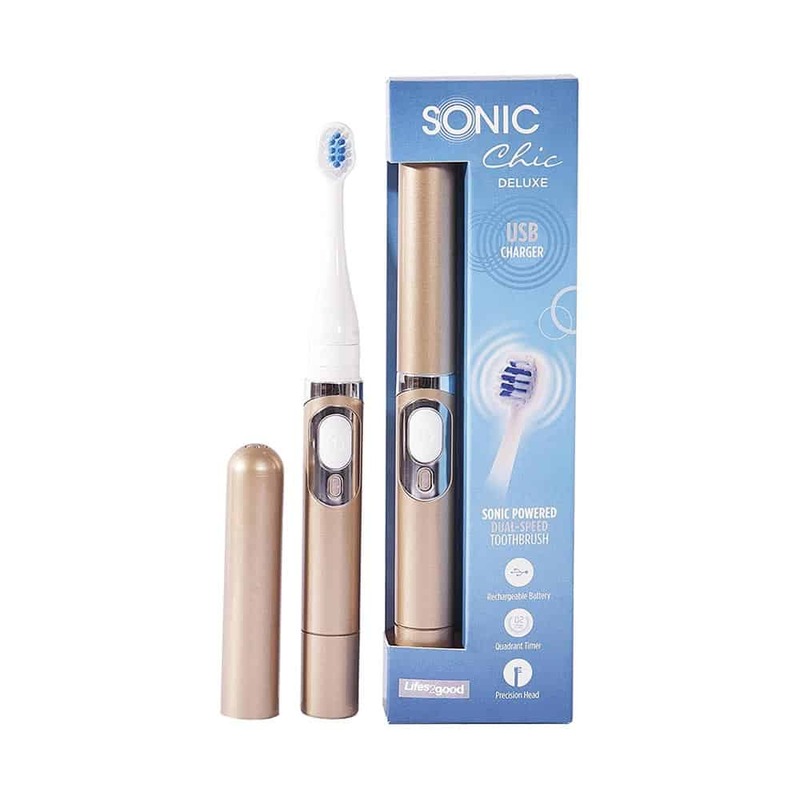 Solid build quality, 2 year warranty and cost effective replacement heads as well as a low initial purchase price make this our favourite electric toothbrush for travel. Available in a range of colours to suit different users styles, the DiamondClean does clean a very good job of cleaning the teeth and mouth, with multiple cleaning modes and a range of interchangeable heads available. It is a particularly stylish toothbrush that comes with an equally stylish charging stand and premium travel case. The charging stand works with voltages of 100-240v out of the box, making this one of the most capable brushes for travellers. The best travel case too, the brush can be charged in the case using a standard microUSB cable, no proprietary cables required and there is space for 2 brush heads. However, even for those on a longer trip you won’t need to charge it all that often, it has a 3 week battery life! Please note: There is a newer model, the DiamondClean Smart, that has the USB charging cable built into the travel case. Technically it is better than the DiamondClean featured here, but we have excluded it from the list because although great it is VERY expensive. 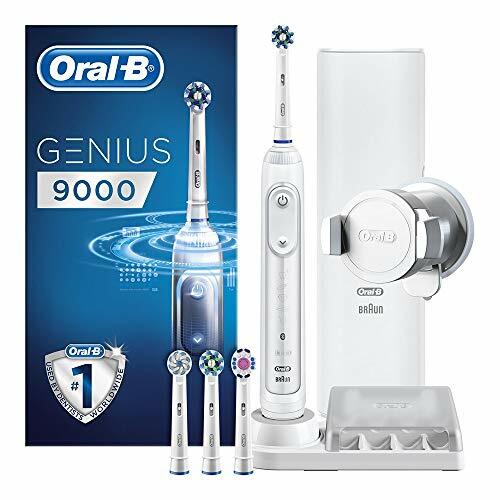 Oral-B’s flagship electric toothbrush it is the most feature rich, one of the most expensive but also one of the brushes best suited to a traveller. 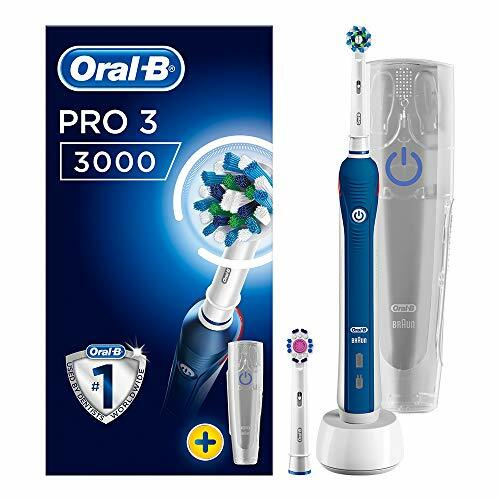 It cleans using the effective rotating-oscillating technology Oral-B are famous for, and which studies show to be the most effective for plaque removal. As you would expect it has all the premium brush features including 6 different cleaning modes, a timer, pressure sensor, battery status icon and 12 days of battery life. It looks stylish and even has Bluetooth connectivity to work with a smartphone app for tracking of your cleans. The neatest feature of this brush is the very premium travel case that comes provided and allows the brush to be charged in the case using the proprietary charger. The charger for the travel case works on 100-240v making it suitable for international travel, whereas the more standard charging stand functions on only 220-240V. Unless you have plenty of space in your luggage you are unlikely to be taking with you the smartphone holder that offers up the enhanced tracking facilities. A solid mid range electric toothbrush, this is not the cheapest brush, but one that offers pretty good value for money. It gives more of the premium brush features including a timer, pressure sensor and multiple cleaning modes. Again, it cleans using the rotating-oscillating technology. It comes with a travel case in the box that can accommodate 2 brush heads and a handle. The case is a tiny bit bulky nor the most sturdy, but functional. The 16 days of battery life is pretty good too for something that is this slim. The charging stand works on only 220-240v without an adapter or voltage converter. A cracking electric toothbrush this is really good for those who travel. Manufactured by a big brand you can trust the build quality and the clean you get from the Colgate 250+. A timer and battery indicator are built in and the interchangeable brush heads are cheap to replace. For such a slim handled brush the battery life is an excellent 2 weeks and a travel cap is included. The battery is built in so you will need the charging stand if travelling for more than 2 weeks. It works on only 220-240v without the use of adapters. 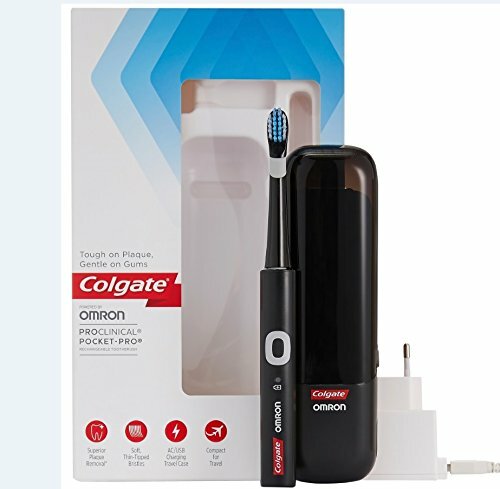 A compact electric toothbrush powered by a single AAA battery, it comes in a variety of designs and has a cap/lid included in the box to ensure the interchangeable brush head remains protected when not in use. This is perhaps one of the best compact and easily transportable options available. Working well for those who are particularly limited in the space they have in a bag, prices range from about £10-20 subject to design/package. The biggest negative is the lack of power compared to a traditional electric toothbrush. The big advantage of this brush is the fact that it is powered by AA batteries. It does not require a fixed power source. It cleans ok, and is water resistant. It does not come with a travel case or cap to protect the brush if carried, there is also no battery status icon. Cheap, often available for less than £10 and comes supplied normally with the batteries included. Manual toothbrushes have the benefit of being smaller and lighter and easier to travel with than an electric toothbrush as standard, but there are still some neat options that can further enhance you travel with a manual brush. Made by one of the leading dental brands, the Wisdom travel toothbrush is compact in its design and very cost effective. The brush head and neck pull out of the handle, which doubles up as a travel case and then once flipped over slots back into that handle to create a more traditional looking brush. The cap is vented to allow airflow and reduce the chances of bacteria building up on the brush but keeping it protected. This is a folding toothbrush from one of the best known dental brands. One of many different manual toothbrushes the firm designs and produces this portable option is hinged in the middle so that the brush head can tuck away into the handle. The handle is fairly robust and provides adequate protection to the soft bristles on the brush head. Hinged in the middle the brush head tucks away into the brush handle when not in use. When folded, the brush head is protected from accidental damage and makes for a compact and neat shape for fitting into a pocket or bag. Airflow still gets around the head to dry of the bristles. The handle has a good amount of grip and they come as a pack of 2. A similar design to the Colgate Portable brush, this is another hinged option from high street retailer Wilkinson. 2 brushes are included in the pack and offer excellent value. Folding in the middle the brush handle is either a vibrant green or blue. The design is such that the brush head is protected when in transit whilst allowing for air to flow through and dry out any remaining moisture on the head. The electric toothbrush can go with you when travelling. From the people we have spoken to, many seem to leave their electric toothbrush at home in preference of taking the traditional manual brush, most often citing convenience as the reason. This seems slightly counter-intuitive when convenience is one of the reasons some go for the electric toothbrush in the first place. So let me explain some of the options you have when travelling with an electric toothbrush. In this instance nothing changes. You can continue to use your electric toothbrush as you would at home. You will need to consider how long you are away for and what you need to do if anything about recharging the battery in the brush. If away for a couple of nights you can take just the brush. If away for a few weeks you will need to take the charging stand in most cases too. You might also want to consider a case for the brush to keep it protected and avoid accidental activation when transporting. Some brushes come with a travel case included, others do not. You could check out our best toothbrush travel cases article that gives a few universal travel case options. Alternatively you could head to shavers.co.uk to see if they have a travel case specifically designed for your brush. Don’t forget to consider whether you need to take a spare brush head with you, might it be time to change your brush head whilst you travel. When you are travelling outside of your home country for example, but to another country that uses the same power voltage as you the principles and things you need to consider are the same as if you were at home. For example, if home is in the UK for you and you are travelling to mainland Europe (France, Germany or Spain) for example, then you should follow the tips outlined in the section above. When travelling to a country that uses a different voltage to that in your home country, all is not lost, but you need to check a few things. For the sake of example, let’s say you live in the UK and are going to the USA. If you are away for a 2 week holiday and your brush has a 3 week battery life, then you can take just the brush. If away for a few weeks you will need to take the charging stand in most cases. If you brush has a charging case this could also be suitable. Now charging is the biggest headache. Not only do you have voltage to consider you have the plug adapter too. The UK uses 240V electrics whereas the USA uses 110V. Most electric toothbrushes bought in the UK and Europe have charging stands that work on 220-240V. So to use them in the USA, you need a power converter to allow the the charging stand to accept the 110V. You can buy these from various retailers online or in the high street. Do your research on the voltage in a particular country to ensure you are getting the right converter. In the instances where the voltage in the country you are travelling to is lower, you need a ‘step up’ converter and when the voltage is higher you need a ‘step down’ converter. 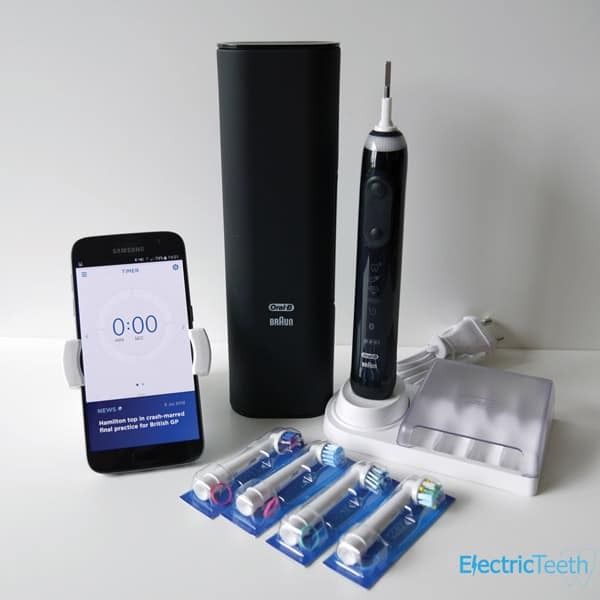 Some electric toothbrushes have charging stands that will support 110-240V meaning you will not need the voltage converter. 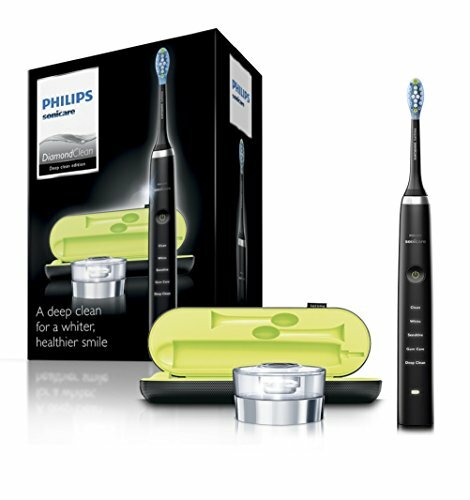 The Philips Sonicare DiamondClean is one example. What you may need as well though is a plug adapter. This is to convert the 2 pin adapter found on most charging stands in the UK and Europe to work with the power supply in the other country. The Skross Pro World (view on Amazon) is a more expensive but all encompassing solution, or you can get specific country adapters. When using a voltage converter, you may need a different adapter to the one you think. 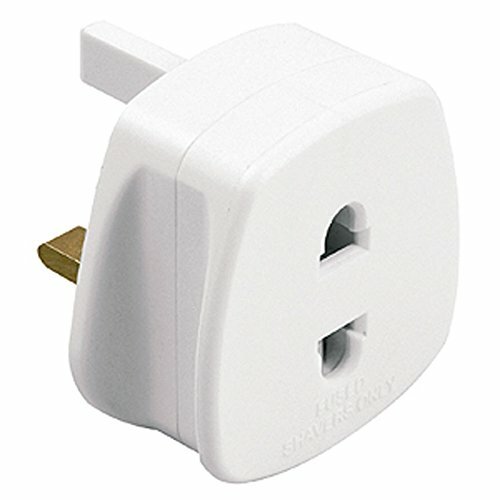 Using the travel form the UK to the USA again, the ‘Step Up’ voltage converter has the 2 pin US connector on it, but actually offers up a 3 pin UK power adapter. However your toothbrush has the 2 pin adapter, so although you are travelling to the USA, you will need the 2 pin to 3 pin adapter, like the one shown below. If you are not sure you understood it all, maybe this article, using an electric toothbrush abroad will help. Now another option might be is if your brush has a travel case that allows the brush to be charged in the case. The Sonicare DiamondClean and Oral-B Genius 9000 are two examples. 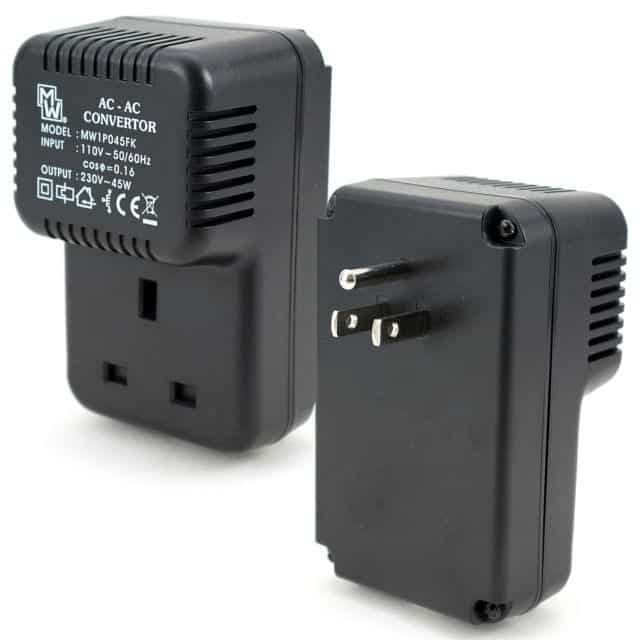 The 9000 has an adapter that accepts 100–240V so you don’t need a voltage converter but you may need a plug adapter. The DiamondClean on the other hand has a microUSB connection and can charge with a USB cable connected to a computer’s USB socket or a mains charger. It comes with a plug for the wall included, but again a plug adapter may be required. If you are thinking it is complicated, don’t worry it is rather! So with that covered other points to consider are a case for the brush to keep it protected and avoid accidental activation when transporting. You could check our our toothbrush travel cases article that gives a few universal travel case options. 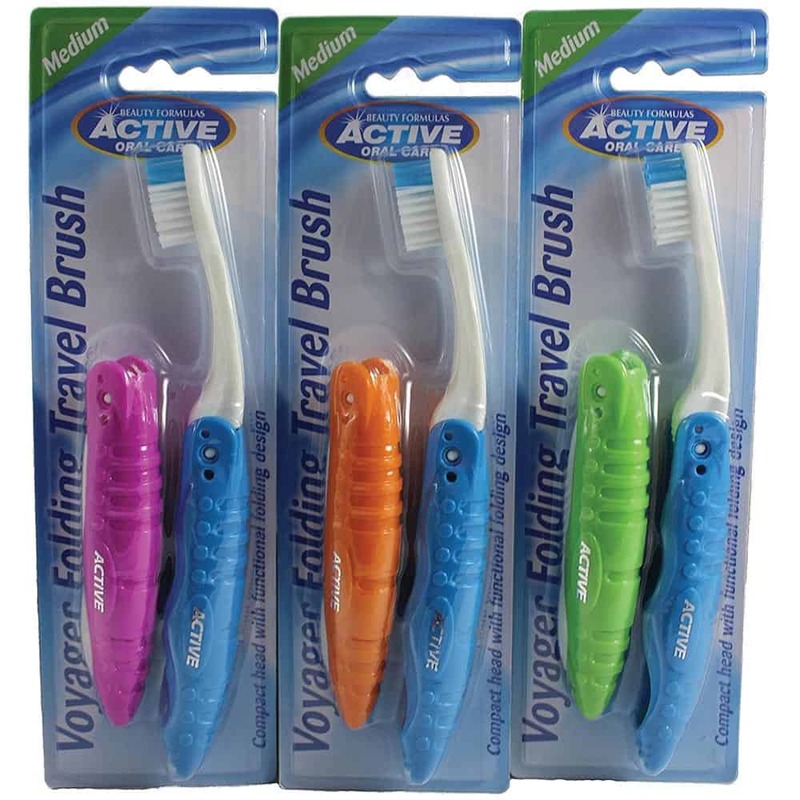 With a manual toothbrush you need not worry whether you are travelling 3 miles down the road or 3,000 miles across the globe as these are typically less hassle when travelling. You don’t need to worry about power sources, your manual brush does not need charging. You may want to consider a travel case though, to protect it from getting damaged when in a bag. Most brushes do not have a specific travel case, but there are loads of third party options from simple caps for the brush head or that encase the brush and leave space for your tube of toothpaste. 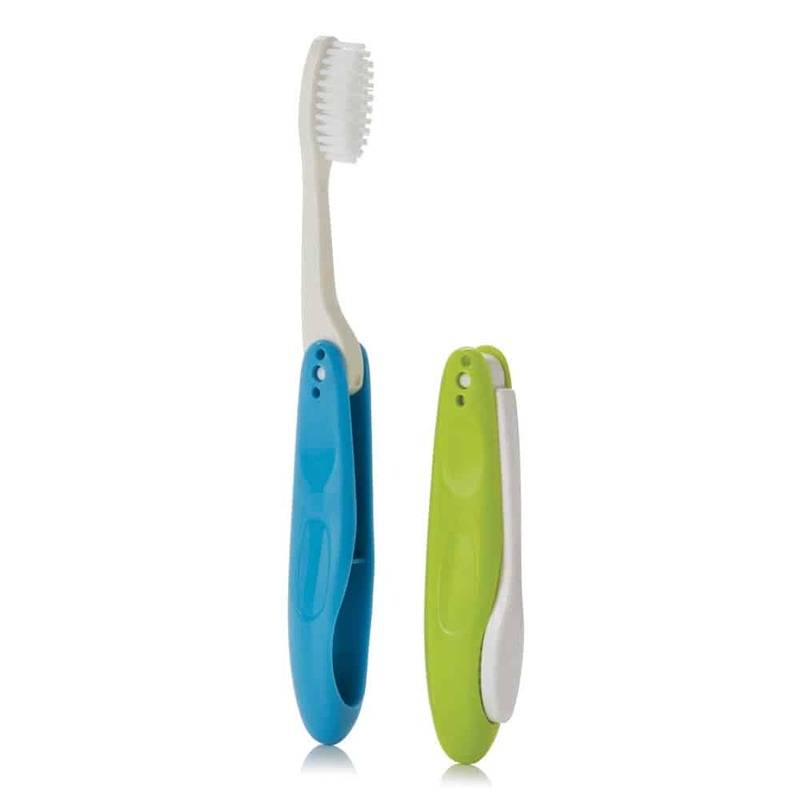 Take a look at our toothbrush travel case post for more details on the options available to you. It is because of the desire to keep things compact and the brush head protected that folding or foldable toothbrushes have become so popular. Folding in on itself the brush head flips over to be protected by what is the handle and case to the brush. This typically makes the brush a bit thicker in transit, but not as tall and is a neat option and it’s a more practical shape. It might be you need to be thinking about when your toothbrush needs replacing, and if you need to carry a replacement. A useful addition to these reviews would be some basic info on dimensions and weight. To me “travel” is mountaineering, and every gram counts. Everyone’s opinion on what defines travel is different. I can understand you are really going to want the smallest and the lightest. Your suggestion is great. We have sort of covered this, but not in this specific article. In fact we include this in our full detailed hands on reviews of each brush. I will however consider whether we add it in future updates to this article. If you want the benefit of an electric toothbrush, then I would suggest the Colgate ProClinical 250+, which is just 59g. It gives 2 weeks of battery life. Review here. Lightest will be a manual brush by far, but it depends whether you want to stick to manual over electric.